As you may know, I recently teamed up with Garden of Life to review their products and host giveaways. 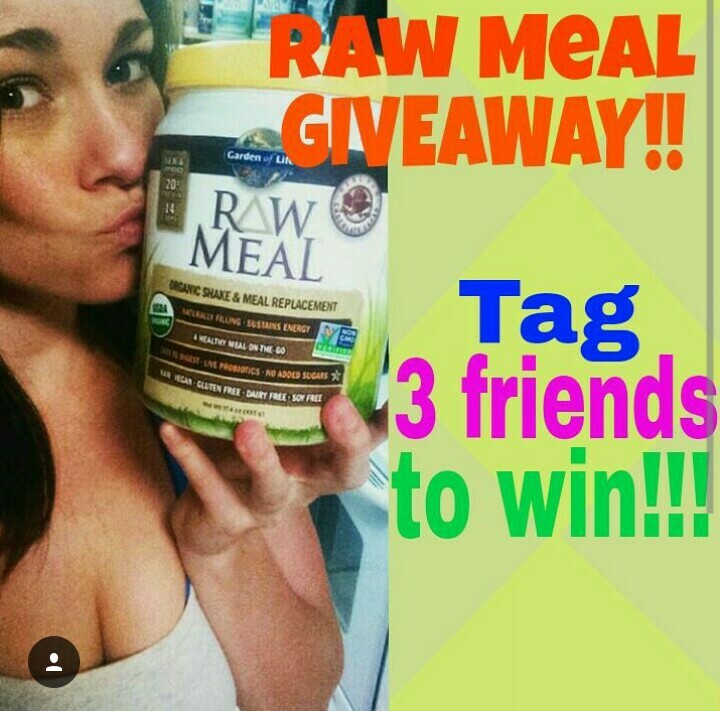 My first giveaway was for a tub of the 45 superfoods-containing RAW Organic Meal, which you can purchase in a local health food store or online. If you go the online route, I recommend purchasing directly from Garden of Life’s website! I am going to go into some details about why this product is one of my favorite products that GOL offers. RAW Organic Meal (previously RAW Meal) is made to act as a snack or full out meal replacement. It is full of amazing ingredients (keep reading) and keeps you full and feeling satisfied. While I like to add things like peanut butter, GOL Perfect Food (review upcoming), or bananas or other fruits, IT ISN’T NECESSARY because it truly is a MEAL and that, in my book, makes it just phenomenal. We have all been so busy or running late and had to rush out of the house before…well toss a scoop of this into a shaker with some almond milk (or cashew/soy/rice/water/etc) and give a shake and *BOOM* a totally nutritious, healthy, full meal you can feel good about eating on the go. It also provides 5-6g fiber (depending on the flavor), 1-1.25g fat, 21 vitamins and minerals providing at least 100% of the daily value for 16 vital nutrients! Did I mention it blends and mixes beautifully? Well it does. No blender needed. Just a shaker. I haven’t tested just stirring it with a spoon…if anyone does, let me know how it goes! 2) FLAVOR – IT TASTES AMAZING! Original aka Unflavored: I love this one when I feel like using a lot of fruit in my shake because it doesn’t take away anything or add anything to the yummy fruit flavors I want! Vanilla: Great flavor & sweetened ever-so-slightly with stevia. I LOVE adding banana to my shake when I use this flavor. One scoop (about 23g) provides 20g protein. TWENTY GRAMS. This includes all essential amino acids. Get ready to read! I was blown away when I first saw how many amazing ingredients are in RAW Meal. It made me wonder how I had never heard of this product before!! Now I want to do my part to spread the word. Be sure to follow both myself and Garden of Life on Instagram (@fitlauraxo/@gardenofliferaw) for Garden of Life giveaways, great recipes, food prep, and fitness!